Formally the Hasso Plattner Institute of Design at Stanford University, the D.school has made a global impact by encouraging students to find out what is most useful. Nicole Perlroth reports in The New York Times. “At the heart of the school’s courses is developing what David Kelley, one of the school’s founders, calls an empathy muscle. Inside the school’s cavernous space — which seems like a nod to the Silicon Valley garages of lore — the students are taught to forgo computer screens and spreadsheets and focus on people. 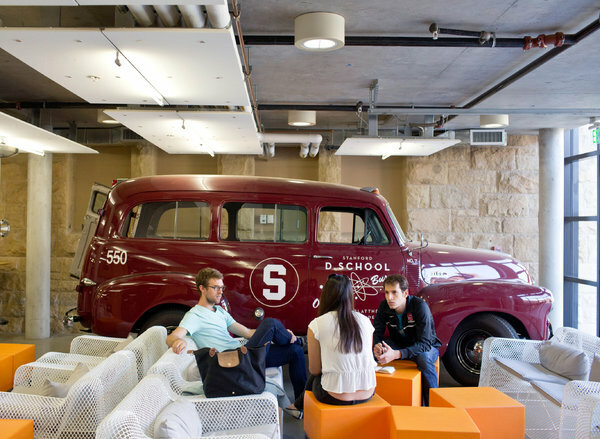 The design institute at Stanford University, known as the D.school, pushes its students to rethink the boundaries of industries. The students are taught to forgo computer screens and spreadsheets and focus on people. So far, that process has worked. In the eight years since it opened, its students have churned out dozens of innovative products and start-ups — everything from ways to tackle infant mortality and unreliable electricity in the third world to a mobile news-reader app. This feature contains a few of those ideas.